On current maps of the Navajo Reservation there is no mention of Navajo Route 8. However, Bureau of Indian Affairs documents mention the construction of a portion of this route. 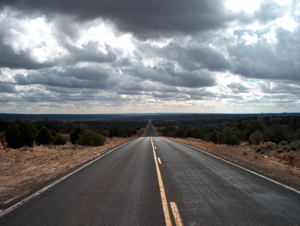 In 1958, the Department of the Interior provided funds for a contract to improve 13.8 miles of Navajo Route 8 between Chinle and Many Farms in northeastern Arizona. In 1965, the Department of the Interior set aside more funds to construct 8 more miles of Navajo Route 8 running between Ganado and Klagetoh in Apache County, Arizona. In addition, a brochure about the Hubbell Trading Post mentions this route as a way to get to this historic trading post. Based on this inform and after consulting contemporary maps, it appears that Navajo Route 8 covers about 39 miles between Round Rock and Klagetoh and is now a portion of U.S. Highway 191. "U.S. Route 191 (Navajo Route 8) near Monument Valley, November 20, 2004" by TheFriendlyFiend from the Netherlands. 1965 News Release-Contract Awarded for Road On Navajo Reservation. www.bia.gov/cs/groups/public/documents/text/idc017292.pdf, accessed March 16, 2015. 1965 News Release-New Roads Make New Horizons for Navajo Indians. 1967 Hubbell Trading Post. Arizona: National Historic Site.